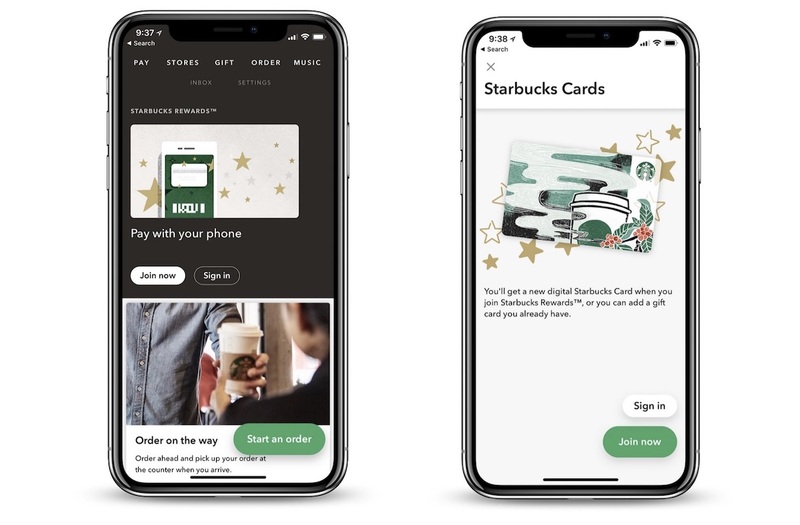 Starbucks' In-Store Mobile Payments Estimated to Be More Popular Than Apple Pay in U.S.
By the end of 2018, an estimated 23.4 million users in the United States will be paying for their coffees and bakery items at Starbucks using the company's own in-store mobile payment system. 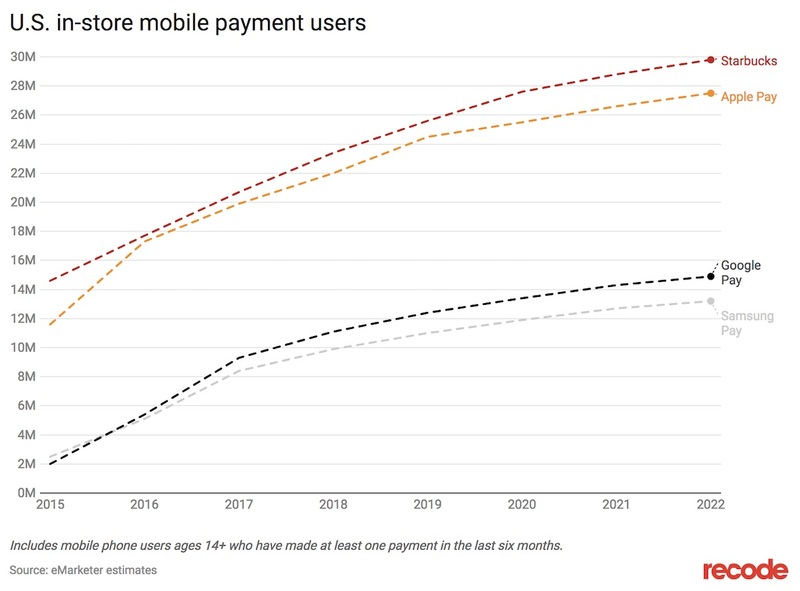 The estimate comes from research firm eMarketer (via Recode), which also predicts that Apple Pay will hit 22 million users by the end of the year. Starbucks itself says that its mobile order-and-pay system accounted for 12 percent of all U.S. transactions in the quarter that ended April 1, and eMarketer predicts the company will hit 29.8 million in-store mobile payment users by 2022. According to the data, Starbucks rises above Apple Pay (predicted at 27.5 million in 2022), Google Pay (14.9 million), and Samsung Pay (13.2 million). This could be due to the Starbucks app's cross-platform availability on iOS [Direct Link] and Android, whereas Apple Pay is locked to iPhones for mobile payments and Google Pay and Samsung Pay are found on Android. Still, it's an impressive feat for a single-restaurant payment app to gather enough users to compete with mobile wallets that are aiming for more universal, multi-location appeal, if eMarketer's estimates are correct. eMarketer also points out that Starbucks launched in-store mobile payments before Apple, Google, and Samsung debuted their dedicated mobile wallets, so early adoption could be helping its success. The app also includes a rewards program that earns customers free food and drinks every time they pay using the Starbucks app. Other points in the report state that Apple Pay is accepted at more than half of U.S. merchants, while Samsung is the most widely accepted at around 80 percent of merchants, while still being the least popular on a user basis. In total, a quarter of U.S. smartphone users over the age of 14, around 55 million owners, will use their devices to make an in-store purchase by the end of 2018. Apple doesn't divulge its Apple Pay usage, leaving researchers and analysts to estimate how many users might be paying for items in store using the NFC system. Earlier this year, Loup Ventures did just that, estimating that 127 million people were using Apple Pay globally at the end of 2017, 38 million of which were in the U.S. -- a much higher estimate in comparison to eMarketer's report. About one year ago, The Wall Street Journal highlighted Apple's launch troubles with Apple Pay. In an interview around the same time, senior vice president Eddy Cue said that Apple Pay was growing faster than other mobile wallets and believed it could go so far as to replace cash, debit and credit cards as a primary payment system. "Does it matter if we get there in two years, three years [or] five years?" Cue asked. "Ultimately, no." Personally, the only reason why I use my Starbucks app to pay is for the points. Does it take into account people that reload their cards with Apple Pay? I used my Apple Pay exactly once on a vending machine. The soda didn't dispense and I got charged for it anyway. Back to cash for me. Wouldn't you have had the exact same problem if you'd put cash into that machine? Of course, this makes sense, the Starbucks app is where I get points, not the apple pay, I wish they would tie them together. In addition, I live in a big city and it is still spotty where apple pay can be used. however, I can go to a small town in the Seattle area, and apple pay is all over. lol. Best public restroom finder app on the App Store. It’s generational. I exclusively use Apple Pay (in Canada). I doubt it will ever catch on with my parents, but I can bet my kids will almost exclusively use Apple/Google Pay as well. Only because of the points. I can't believe this. I feel like someone is operating on inflated/inaccurate numbers here. I remember there was a story that Wal Mart Pay was beating Apple Pay even though Wal Mart pay was only available at Wal Mart at the time-- Couldn't believe that one either. I believe Apple Pay isn't doing as well as people expect, but I can't believe that Starbucks' system is getting more daily users than a payment system available to almost every other retailer on earth. You might want to re-read the story. I don't believe it's saying what you think it's saying. Instead, I believe this is about purchases ONLY at Starbucks, not Starbucks vs. cumulative transactions "with every other retailer on earth." However, if this is some worry about Apple not being #1 in the latter, I suspect good old plastic card usage still probably thoroughly thrashes any of these pay-by-phone options. For the life of me I don't know why people would allow a company to hold their personal funds in escrow, making money off the interest. It's puzzling, but hey to each his own I guess. Given checking account interest rates, the money I might keep on a Starbucks card isn't going to earn any significant interest. Starbucks rewards are a better return.